David Robertson, became a partner in the firm of 'Moon, Langlands & Co,' drapers, clothiers and general warehouseman after having served more than a decade in their employ. 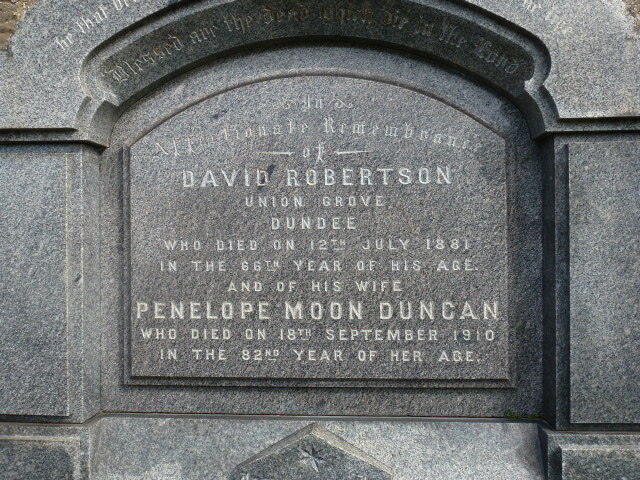 A founder of Dundee's Young Men's Christian Association, he also served as President. 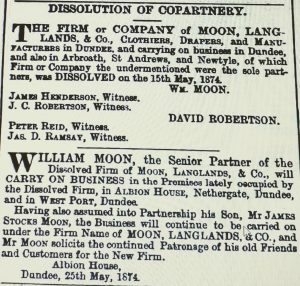 Subscriber 160 – William Moon – he and David Robertson were partners of ‘Moon, Langlands and Co.’ William Moon was also his wife’s uncle. 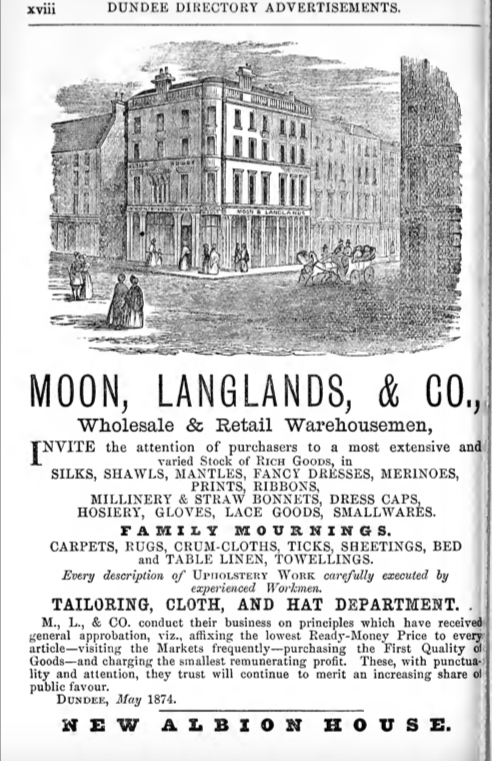 David Robertson, a relative of William Moon, entered into the drapery business as an employee of 'Moon & Langlands,' drapers and merchants about the year 1833. He remained in their employ for a further 13 years before being assumed into the firm as a partner in 1846. 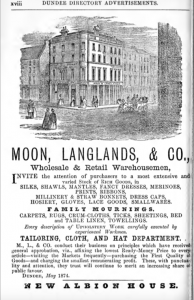 Thereafter, the firm came under the title of 'Moon, Langlands & Co.' Their successful business strategy was to 'charge the very smallest possible profit, for ready money and, they trust, by attention and punctuality, to merit an increasing share of public favour.' It had been the practice to haggle or negotiate 'abatements' or discounts although 'Moon, Langlands & Co' took pride in their approach of only ever offering the lowest possible prices. 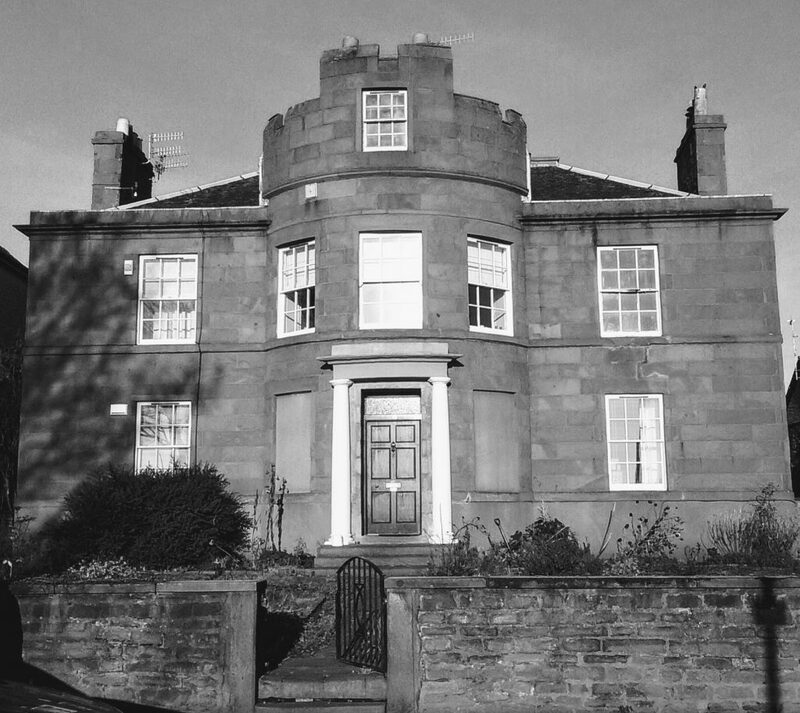 Partner William Langlands elected to leave Dundee (and the firm) circa 1854 in order to join his brothers in Australia, whereupon a copartnery between William Moon and David Robertson was established. The name of the firm remained the same. David Robertson, born in the parish of Newtyle, began his working life, around the age of 18 years, as an employee of William Moon (also a native of Newtyle). 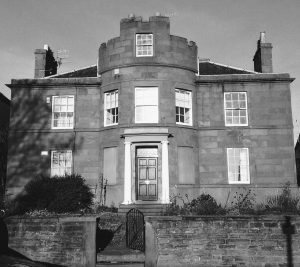 He was found to have been assiduous in his approach towards business and was assumed as a partner in the firm of ‘Moon, Langlands & Co.’ by the time he was 30 years old. 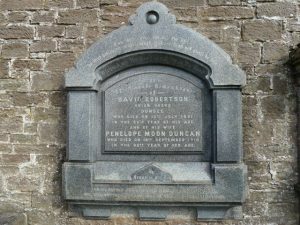 He and his wife, Penelope Moon, (William Moon’s niece) bore no family and David’s focus outwith work was ultimately centred upon religious and benevolent enterprises. 1874 witnessed the retiral of David Robertson from the business with which had been associated for more than 40 years. The local press intimated the dissolution of his copartnery with William Moon as of 15 May 1874, they having been the only partners. He thereafter left the business, ‘having amassed considerable means, and retired into private life.’ This ‘private life’ enabled him to become evermore immersed in the religious causes he favoured. The 1881 census listed as ‘visitors’ to Union Grove, Magdalen Green, ‘Major Whittle, (age 40) Evangelist, born America. Mr Jas McGranahan, (age 40) Evangelist, born America, and Mrs Jas (Addine) McGranahan, (age 38) born America.’ Further, we have Elspeth Duncan, (age 80) Mother-in Law, born Newtyle, (William Moon’s sister) residing with the Robertsons. Messrs Whittle & McGranahan, American Evangelists, conducted a tour of Scotland in 1881 with Dundee being on their tour schedule. They conducted a series of evangelistic services, prayer meetings and lectures, not only at the Y.M.C.A. but also at Bell Street U.P. 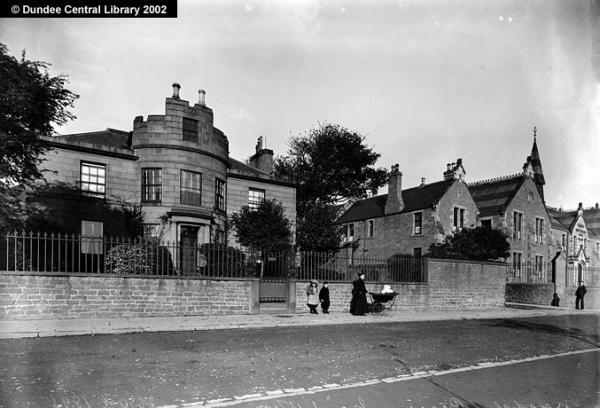 Church, the East Church, Broughty Ferry and at the Kinnaird Hall. David Robertson left £17,684 (current value £14,147,200) after debts, and in addition to the legacies left to family members, the following bequests are listed here from his will. Statutory Registers. Lundie, Forfarshire. Marriages. (1859). 306/2. ScotlandsPeople website. Census Records. Dundee. (1861). 282/ 2 26/ 29. ScotlandsPeople website. Census Records. Newtyle. (1851). ScotlandsPeople website. Dundee Courier, 26 October 1859. p.4. Findmypast website. The Aberdeen Journal, 13 July 1881. p.4. Death Notice. British Newspaper Archive website. Dundee Postal Directory, 1861-1862. p. 197. 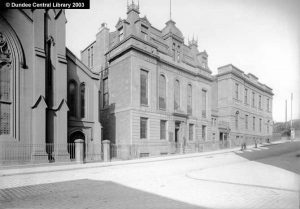 Dundee Central Library, Local Studies. Statutory Registers. Deaths. Dundee. (1881). 282/1 294. ScotlandsPeople website. Statutory Registers. Dundee. Deaths. (1881). 282/1 294. "As certified by John Robertson MB. CM.". ScotlandsPeople website. The Northern Warder and Bi-weekly Courier and Argus, 19 July 1881, p.3. British Library, British Newspaper Archive website. Obituary. The Weekly News, 16 July 1881. British Newspaper Archive. British Library website. Dundee Postal Directories, 1867-68, 1869-70, 1871-72, 1874-75, 1876-77, 1880-81. National Library of Scotland website. Dundee Postal Directory, 1878-79. p.54. National Library of Scotland website. Dundee Postal Directory, 1869-70. p.34. National Library of Scotland website. Dundee Postal Directory, 1880-81. p.49. National Library of Scotland website. Dundee Postal Directory, 1867-68. p.30. National Library of Scotland website. Dundee Postal Directory, 1874-75. p.62. National Library of Scotland website. Legal Record. Wills and Testaments. Dundee Sheriff Court. (1881). SC45/31/31. ScotlandsPeople website. Dundee Directory, 1864-65, p.23. National Library of Scotland website. Dundee Courier, 27 October 1858. p.2. Findmypast website. Dundee, Perth and Cupar Advertiser, 3 March 1846. p.1. British Newspaper Archive website. The Dundee Advertiser, 23 December 1863. p.1. List of subscriptions to the Dundee Albert Institute (public notices). British Newspaper Archive. British Library website. Dundee Postal Directory, 1864-65. p.178 and p.248. National Library of Scotland website. 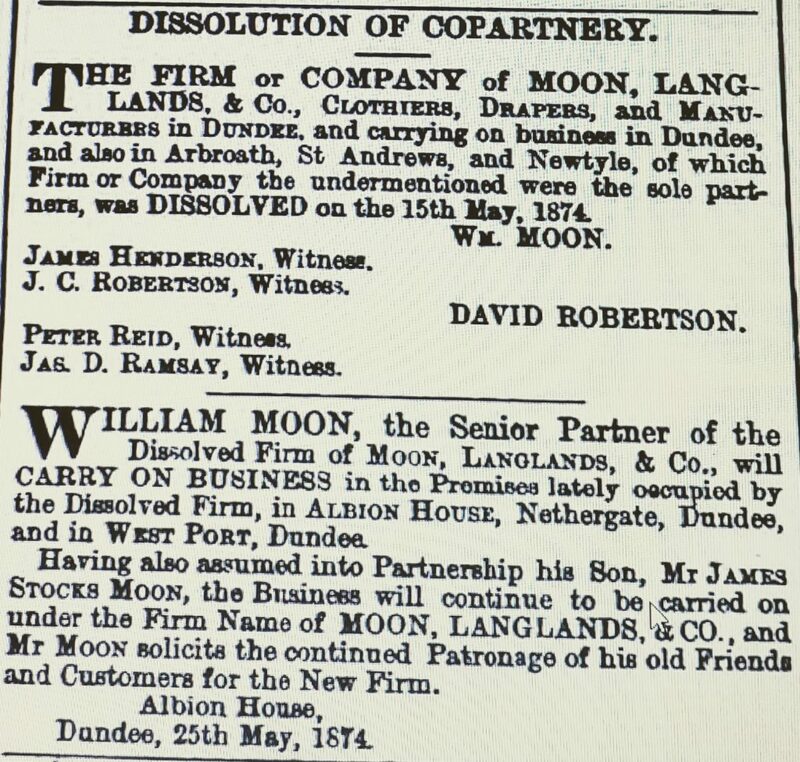 Dundee, Perth & Cupar Advertiser, 6 March 1846. p.3. Findmypast website. The Dundee Advertiser, 13 July 1881, p.5. British Newspaper Archive. British Library website. Dundee Postal Directory, 1874. p.11. 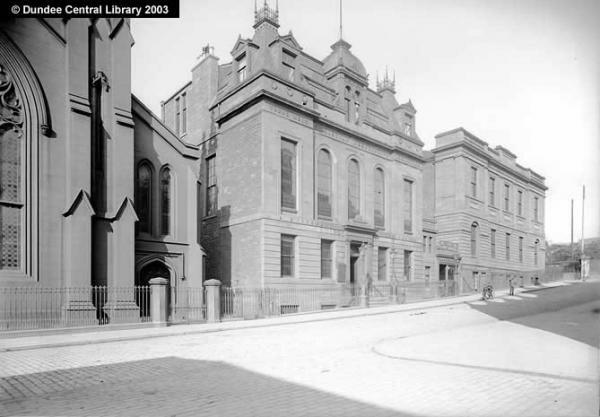 National Library of Scotland website. Aberdeen Press & Journal, 13 July 1881. p.3. Findmypast website. Census Records. Dundee. (1881). Scotlands People website. Dundee Courier, 29 March 1881. p.1. Findmypast website. With grateful thanks to the staff of the Local History department, within Dundee Central Library, and the City Archivist and his staff within Dundee City Archive and Record Centre. The information above about David Robertson has been collated from a range of digital and hard copy sources. To the best of our knowledge it is correct but if you are relying on any information from our website for the purpose of your own research we would advise you to follow up the sources to your own satisfaction. If you are aware of an inaccuracy in our text please do not hesitate to notify us through our Contact page.